What would life be like without color? Ever since one can think back, color has always accompanied mankind. Dyes - originally obtained exclusively from natural sources - are today also produced synthetically on a large scale and represent one of the very mature and traditional sectors of the chemical industry. The present reference work on Industrial Dyes provides a comprehensive review of the chemistry, properties and applications of the most important groups of industrial dyes, including optical brighteners. It also outlines the latest developments in the area of functional dyes. 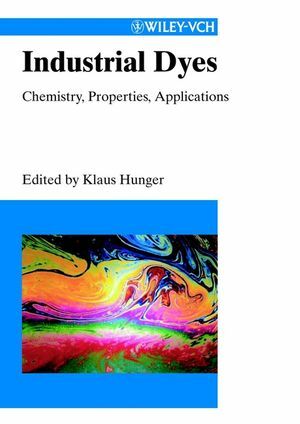 Renowned experts in their respective fields have contributed to the chapters on chemical chromophores, synthesis and application of the various dye classes, textile dyeing and non-textile dyeing. The book is aimed at all professionals who are involved in the synthesis, production, manufacture or application of dyes and will prove to be an indispensable guide to all chemists, engineers and technicians in dye science and industry. Klaus Hunger was the research director of the hydrazone pigments unit at Hoechst AG. Today, he is the Managing Director of Decernis GmbH. "Despite the width and depth of this subject, Industrial Dyes gernerally suceeds in supplying an introductory overview of all the major classes and applications. ... practitioners and students...should find Industrial Dyes to be a valuable resource." "A very positive feature is that the most recent literature is covered, providing the reader with a quik route into the area...To summarize, the book can be recommended for industrial dyestuffs chemists and for everyone working on the science of dyes, as it gives a broad overview of the great variety of industrial dyes and their applications." "Wiley-VCH now have a comprehensive set of titles in colour chemistry covering Pigments, Pains and Coatings, and Dyestuffs and this latest volume is up to the high standart set by previous works...this is a very useful volume and should be in the library of all dyestuff manutactures." "Although it is not a manual to be used at the bench, later chapters emphasize applied aspects and problems... What is remarkable about these lists of references is the inclusion of a very large number of industry documents and patents. The style of the book is technical without "wasting" any time on a narrative; as a consequence the information density is high and suits the needs of the busy professional seeking "distilled" specific information. The volume is thoroughly produced and manufactured according to very high standards. Industrial dyes will be of interest and value to every laboratory concerned with dye chemistry, and to libraries of organic chemistry institutes in general."